The Mojave Road from Rich Hill on Vimeo. Following an ancient trade route through some of the most inhospitable terrain on the planet. "Imagine driving halfway across California for two full days, without ever encountering another vehicle. 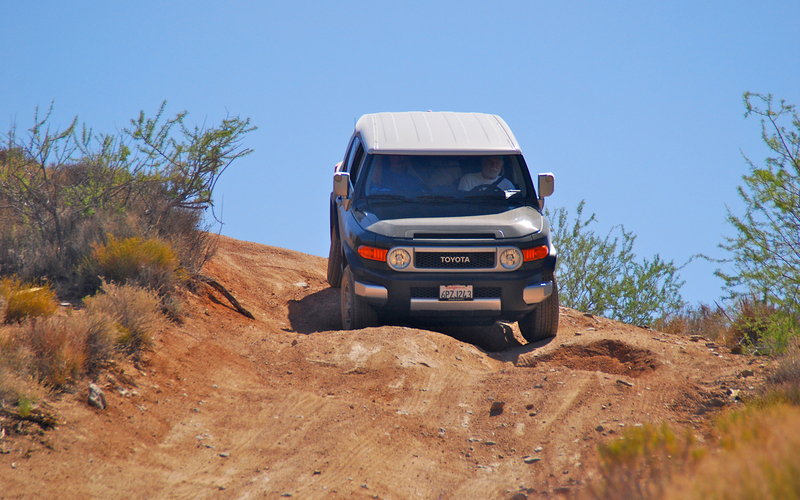 Impossible though it may seem in a state with more than 35 million registered vehicles (that's one for every 130 square feet or so of the Golden State), our two Toyotas had the road -- more than 130 miles of it -- entirely to themselves." So begins the article from the December, 2012 issue of Truck Trend by Greg N. Brown. You can read the rest of it and view the photos at the Truck Trend Web site. 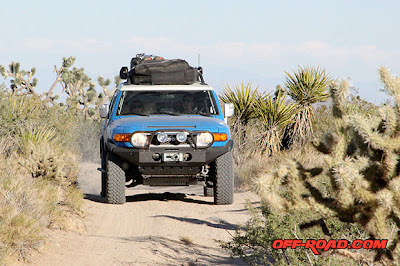 Over at Expedition Portal, Marianne Hyland shares a great write-up and photos from her family's trip over the Mojave Road. It's a nice reminder of why so many of us love spending time out in the East Mojave. We received the following Road report from Will Wagner. Please note the missing items - if you run across them on your travels, please contact us and we'll get you in touch with Will. Thanks!! Myself and two friends just completed the Mojave Road, 4/19-22 going from Afton Canyon to Avi. We found the road to be in great condition, water crossings low, and Soda Lake dry. We did however seem to lose part of our self contained fire pit some where between Rasor rd and Paymaster Mine road. It is heavy gauge steel in a black bag that says Pit2go on the bag. Any mention of the lost parts would be greatly appreciated. Situated between Interstates 15 and 40, the preserve boasts solitude, Joshua tree forests, snow-dusted peaks and desert horizons, and it may be our best-kept secret. Click here for a slideshow of additional photos accompanying this story. For a nation in perpetual motion, to cross the lands that make up the Mojave National Preserve has long meant only one thing: You are very nearly somewhere else. For westward-bound travelers, whether they came through open wilderness, along the now-overgrown Mojave Road or later by the legendary lanes of Route 66, this most American of deserts was little more than an obstacle to more promising lands. Long before them, Native Americans traded regularly across these harsh miles, as enamored as everyone else with speed. Tribal legend has it that top runners needed only a few days to reach the coast. Today, the Mojave is ringed by the circuitry of a restless nation. Interstate 15, the preserve's northern border, is more parking lot than road, a blinking artery of brake lights shimmering late into the desert evenings. To the south, great fleets of trucks sail day and night along Interstate 40 in the shadow of Route 66, the mythic furrow through American consciousness once known as the Mother Road. Enormous freight trains also rumble at all hours across the Mojave's vastness. And above, the skies are grooved by the high-desert contrails that Joni Mitchell sang about, descending through the blue toward Los Angeles. Amid all this is the Mojave National Preserve: beautiful, empty and — unless you're within earshot of the railroad — as quiet as the ages. To feel so far off the path while so close to some of the country's best-beaten ones is both a miracle of conservation and an accident of politics. In 1994, after years of wrangling, three new desert designations were formalized: Joshua Tree and Death Valley became national parks, but Mojave was granted only preserve status. It's an inferior category of protection; hunting, for example, is permitted. But a happy irony of Mojave's lesser designation is that the preserve, unlike its A-list siblings, barely registers on tourists' radar. Even seasoned Southwest travelers may not realize what they're missing: 1.5 million acres of solitude draped across vast forests of Joshua trees, snow-dusted peaks and measureless desert horizons. If the national park was America's best idea, the national preserve — and this one in particular — may be our best-kept secret. Despite those many acres — Mojave is the third-largest National Park Service parcel in the lower 48 — it's easy to make or break a journey here. Heading east from Los Angeles, a good first port of call is Barstow, home to the preserve's visitors center and the inaugural miles of I-40. There's a regularly stolen sign at the interstate's start, pointing out the 2,554 miles between here and the North Carolina coast. The next Starbucks isn't quite that far, but consider some preventive caffeination in Barstow. As soon as you get on 40, jump off it again at Exit 7 for a quick look at Daggett. Visit the Desert Market (35596 Santa Fe Ave., Daggett, Calif.;  254-2774) for drinks, a chat and the chance to marvel at the remnants of the next-door Stone Hotel, where John Muir once stayed. Just east on Route 66, take the turnoff for the Daggett Pioneer Cemetery, where you and some central casting-caliber tumbleweed can wander among wind-swept graves. From here head east — quickly on the interstate or slowly on what's left of the Mother Road, which bumpily parallels its multilaned successor. You'll pass Newberry Springs, where cult classic "Bagdad Cafe" was filmed. Next is Ludlow, where the American roadside diner finds perhaps its purest, most deeply fried incarnation at the Ludlow Cafe (25635 Crucero Road, Ludlow, Calif.;  733-4501). For those with heavy eyelids, there's also the Ludlow Motel (make reservations and check in at the Chevron station across from the motel and cafe,  733-4338). It won't win any thread-count awards, but it's inexpensive, clean and, in road-trip terms, as pitch-perfect as the diner next door. About half an hour east on 40, Kelbaker Road brings you into the preserve itself. Sixteen miles in is the turnoff for Kelso Dunes, 50 square miles of sand and little else. Some dunes are more than 600 feet high — worth singing about, and so they do, rather spookily, when the mood strikes them or a hiker kick-starts a cascade of sand. Wind-carved and yellow, these are the dunes of movies. It's easy to imagine C-3PO staggering over a crest, and several European hikers I met here half-joked that this was the only corner of the Southwest that looked like "real" desert. Hiking on dunes is tiring, even — or perhaps especially — when they're singing to you. So it's time for lunch. Seven miles past the dune turnoff is Kelso Depot, a 1924 outpost where trains stopped for water and passengers to dine. After the frenetic World War ll years — iron for Liberty ships passed through here — the depot entered a long decline. Reopened in 2005, after a meticulous restoration, this Spanish Revival structure is now a charming and genteel counterpoint to the endless surrounding miles of Mojave wilderness. After a root beer float ($3.50) at the vintage lunch counter, take time to explore the well-curated exhibits that fill the depot's sepia-tinged rooms. Then wander along the colonnade that fronts the railway, where signs forlornly announce long-forgotten passenger services even as ponderously laden freight trains roll past. The freight trains are noisy reminders of the fact that Kelso was built only to make other journeys possible. Now, in retirement, this palm-shaded intersection of history, geography and railway is at last a destination itself. Heading north from Kelso, it's time to work off that third root beer float. My favorite Mojave hike is the Teutonia Peak Trail. Author J. Smeaton Chase, despite earning a decent living chronicling California's natural splendor, couldn't manage a kind word about the Joshua tree: a "weird, menacing object, more like some conception of Poe's." Those who disagree will be at home climbing through the world's largest and densest Joshua tree forest (eat your heart out, a certain nearby national park). The last rocky scramble on this four-mile round trip pays off, I promise, with a stunning view over Cima Dome, the vast volcanic uplift that now lies beneath you. For a selection of other easy-to-moderate hikes, head to the Hole-in-the-Wall Information Center by way of the unpaved Mojave Road, or directly from I-40 and Essex Road. Start with the aptly named Rings Loop Trail, which involves climbing out of a canyon with the help of some judiciously placed metal rings. There's also the Barber Peak Loop Trail, a well-marked mile-mile walk that includes the canyon scramble and much more. The visitor center staffers are smiling and helpful, happy to chat about the recent snow, and why they came here, and — if it's getting late — where to rest your head. They and most anyone else will tell you that there's no better place to spend a Mojave night than in Nipton, Calif. Hollywood native Gerald Freeman bought this entire ghost town — "population, one hobo" — for less than the cost of a Manhattan parking space. Slowly, it's being renovated and restored. The town's adobe centerpiece is the Hotel Nipton, with front-row views on a desert garden, the railway and the impossibly vast Ivanpah Valley stretching out under the red glow of distant peaks. Everyone loves the sound of a train in the distance — the operative word being "distance." In Nipton, the bedrooms and the rail line are separated by about 20 yards. But somehow, I've rarely slept as well, a common report from guests. Maybe it's the warm welcome, the cold beer or the thought of bighorn sheep dozing on the starlit mountainsides. Or perhaps even an earth-shakingly close train, like the planes above and the pinprick automobile lights on the interstate, crystal clear through 20 miles of bone-dry desert night, makes you appreciate what you've just found: in a restless country, a place to rest. You might enjoy this Off-Road.com article posted in December about a trip on the Mojave Road, with photos. They took a few short side trips to see additional sights often visited by those traveling the Road.